FIJI'S FINEST? Think not. 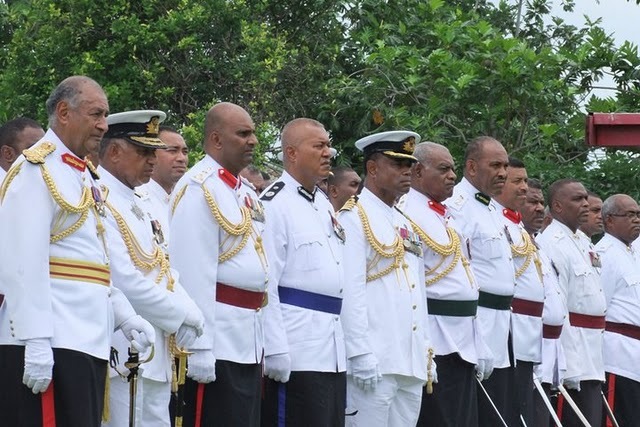 Bainimarama, second left, and his officers at the state funeral for Josefa Iloilo in February. They coat themselves in medals but they're the reason for the international sanctions and for Fiji continuing to be locked out of the Pacific Islands Forum. The 40th Forum ended yesterday with the decision Fiji should remain suspended, although it was agreed it could poke its head in the door at the Pacer Plus discussions. New Zealand and Australian prime ministers John Key and Julia Gillard rightfully withstood lobbying by the small island states, particularly the Melanesian countries who were in Nadi last week, to readmit the unelected government of Frank Bainimarama to the biggest annual gathering of the year. As was expected and as should be the case. Below, the decisions that regard Fiji in particular from the Leaders communique after their retreat yesterday. They look like a bunch of Geriatrics ! The bottom of the barrel ! Photo reinforces original opinion -"unemployable motley looking crew". How nice! So those MSG leaders had a nice holiday in Fiji then went to PIF and forgot everything they had discussed. What a waste of money by these illegal rubbish regime!! They planned everything so they could get in, wine and dine the MSG to lobby on their behalf, a biased Lowly poll, twisting of words of the NZ leader and intensive media campaign by the Ministry of Misinformation via Sharon whatever her name is, all for a big fat 'get lost'. Nah...too far and too expensive. Just ship them off to Kiribati to AT! He's a huge fan! Maybe they can assist him with saving the place from sinking faster! Bainimarama dresses very whitish........ reminds of the saying "A wolf in sheep's cloth" or more fitting is the relative old Fijian saying "Bulubulu Boro Vulavula". Somebody tell us the factuals about FMF...(not flour mills of fiji),the other fmf...are`nt the Brigadiers,Lt Col`s ,Colonels,Majors,Captains and Lieutenants more in numbers,compared to those below them? Vaka vei au sa lewe levu na turaga-ni-valu ka sa lewe lailai na liga ni wau....no wonder they can`t help but look at their toes...top heavy!!!!. @annon;8-42pm...`bulubulu boro vulavula`...sa dina sara nai vosavosa vaka viti oqori. swhat has happened to Aziz? E ra sega ni bulubulu boro vulavula; Era Agilosi sulu vulavula ka ra digitaki nai vua Kalou, me ra tuberi Viti ena i lakolako balavu oqo. WHITE GRAVE WITH A BLACK HEART INSIDE IT...FRANK N AIASS KAIKUM..
SHAMEFULL ON YOUR 2 GUFFY'S..
Not a very happy bunch.Aziz didn't have any white suit for the day so wasn't invited. Hehehe! @Koi Waimaro.11:17am..allow me to edit your post..`Era Agilosi yalo ca vaka-i-sulu vulavula digitaki mai vua na Tevoro me ra vakatotogani Viti ena i lakolako vaka-mataboko oqo. Suggest you stick to the i-taukei venecular when communicating,meanwhile try to get an English crash course. BALD heads, grey hairs, pot bellies - boy, time to retire boys!!!! Now wonder this bloody country is getting SENILE!!!! AND, WE ARE HEADING NOW WHERE!!!! I see the rolling stone Kurusiga is amongst the kana lotos!!! Gathers no moss the man!! You know what?,when I see that photo I fell loloma to these guys because all the senior officers who tried to advice him not to stage the coup has been dismissed. So this are the lot who came in not for the people and the vanua of fiji but for their pocket. Epeli Nailatikau,what was he doing before this,the only decent thing he is doing is PROMOTING CONDOMS. There are lots of good things a president of a nation could do. that Tikoitoga, who is looking after the baby from your previous office. So this is how these angles sent by Satan operate . naming a few they are all the same anyway. AU SA LOLOMA DINA.